This won't be the best "guide" for the budget traveler - we spent two weeks in Italy staying with Yann's parents who were living there for the year. Although we can't factor in costs of accommodation, we should say that we found food and transport costs to be cheaper than we had thought (especially the food). We landed in the Umbrian capital, Perugia, on a Ryanair flight, which was pretty awful, but incredibly convenient and cheap. 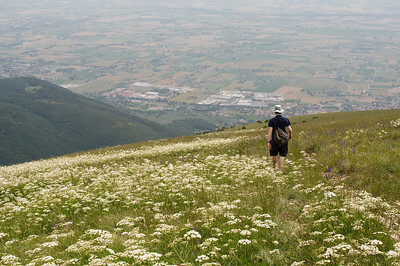 In general we preferred touring Umbria over Tuscany, its touristy neighbour. Not that Umbria didn't have any tourists, but never in the uncomfortable numbers that we encountered in Florence and Rome. Perugia was where Yann's parents were living, so we were among the minority of passengers on the Ryanair flight not moving onwards to a bigger tourist centre like Rome or Florence. The region's provincial capital has a lovely old centre perched at the top of the hill on which the city sits. The old city centre is entirely closed to vehicular traffic and open-air restaurants line the cobble-stone streets. In the evenings, especially warm weekend ones, it seemed that all of Perugia has made their way up the outdoor escalators to stroll around or congregate in the main square. We could count the number of tourists on one hand. Perugia was our base for the trip (Yann's parents were living in an apartment a few meters from the base of the outdoor escalators). We spent most of our time wandering around eating gelatos and drinking cappuccinos which might be why we enjoyed the city so much. 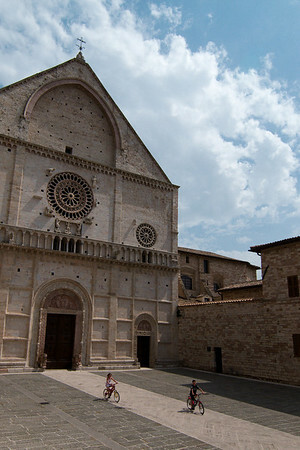 Birthplace of St Francis of Assisi and major tourist draw. As easy as it was to find wall-to-wall St Francis souvenirs it was just as easy to find a quiet side street free of vendors and other visitors. St. Francis himself is buried in the lower section of the monumental church bearing his name and visible from kilometers away. He is guarded by a Franciscan monk who, when we were there, seemed to have given up completely on enforcing the photography ban as pilgrims snapped away wildly at the modest tomb. The city is dotted with dozens of smaller but no less lovely churches and life in the city seems to be little disturbed by the tourist presence. 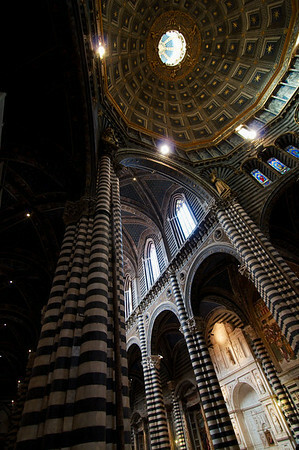 A highlight of Umbria. Because we can't go anywhere without a walk for which we are ridiculously unprepared, we ended up on a hike to the summit of the local Mount Subasio (1280m). Our original plan had been an 8km walk between the towns of Assisi and Spello, but by the time we had purchased a trail map it was noon and we had thrown an extra 8 km to the hike including a 950m climb up and then back down again. It was a Saturday afternoon when we did the hike and in 6 hours we crossed paths with two people (other than those at St Francis' Hermitage which was on our path and accessible by car). Maybe locals knew that the hot summer weather would obscure what would have been otherwise unparalleled views of Assisi and surrounding countryside. We would recommend this activity with the following changes: wear proper shoes, leave early in the morning, do the hike in autumn or on a clear day. 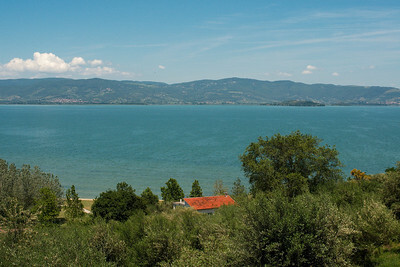 Lake Transimeno is a large lake less than an hour's drive from Perugia. We visited the village of Castiglione del Lago on recommendation from our guidebook. The tiny village is on top of a hill looking out over the lake. We arrived on a Wednesday just in time to catch the tail end of the weekly market. The village deserved more of a visit than we gave it, but we had planned a day of lounging by the water - where we found a spot by the lake, with a little bit of sand and grass to lie on. This small village is surrounded by vineyards growing Sagrantino grapes the only grape used in the production of the local Sagrantino di Montefalco wine. We stopped for a wine tasting at the region's only vineyard open to the public, Arnaldo Caprai. Our visit coincided with the trip's hottest day and we didn't last very long in the vineyards. With most locals hiding from the afternoon heat, we had the village to ourselves and we wandered peacefully through it. 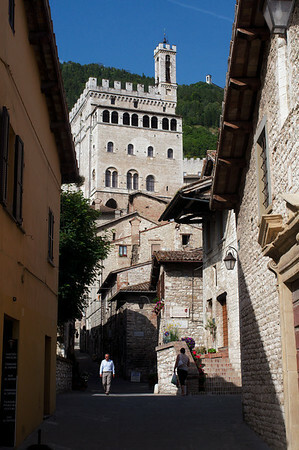 Gubbio is a small medieval town dramatically set along along Monte Ingino in Umbria's Apennine Mountains. We wandered through the empty streets on a rainy day, admiring its dark, angular gothic architecture. The highlight of Gubbio was riding Gubbio's funicular, dangling in bird-cage like structures, wondering if the ageing machine would get us safely the top of the town. At the top of the funicular is the Basilica of Sant'Ubaldo, unique in that it houses the mummified body of the thousand year old Saint Ubaldo, patron saint of Gubbio. 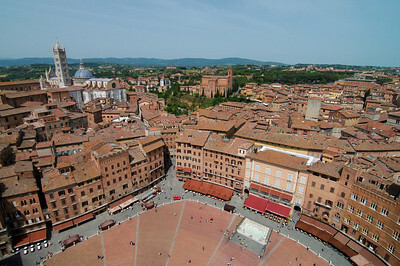 If you plan on visiting this famed city in June then plan on visiting along side lots and lots of other tourists. We arrived at 8 a.m. giving us the chance to visit a few things before the tour groups invaded. 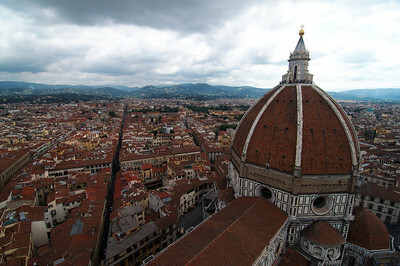 Florence's main sight is the cathedral, its splendid facade and its gigantic duomo (dome). I made Yann climb both the dome and the tower facing the dome, it was the first thing we did it in the morning and the views were spectacular and the stairways not too crowded yet. 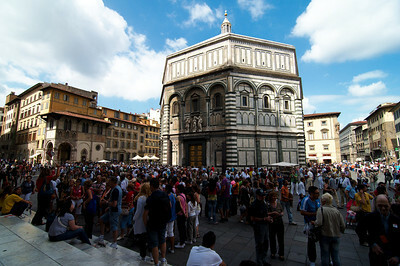 But in the afternoon the plaza surrounding the cathedral as well as pretty much every inch of Florence sidewalk was overflowing with fellow tourists. 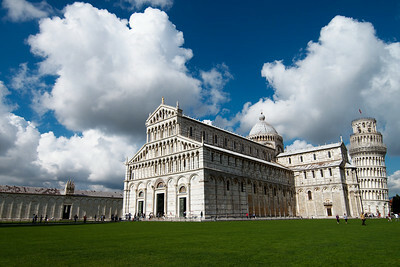 Pisa is really more spectacular than its leaning tower. The tower is interesting for a few minutes, but it is the neighbouring cathedral and the baptistery that are the more captivating sights. 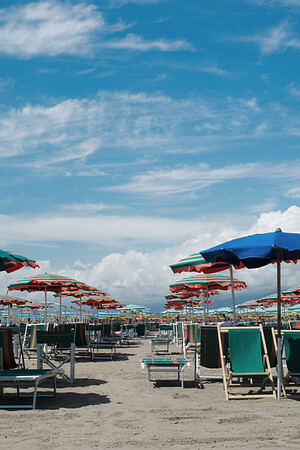 It wasn't quite beach season yet (so we got a discount on umbrella and chair rental). The water was clear and warm, the perfect place for our baby nephew to dip his feet in the ocean for the first time.